Today, I am very happy to have the opportunity to share an interview I did with Giselle Gianella Gabe, a hypnosis professional located in Singapore. Giselle is a very successful and enthusiastic hypnotherapist, as well as being an excellent hypnosis and hypnotherapy trainer in Singapore. She received her hypnosis and hypnotherapy certification training from our hypnosis training school, the Banyan Hypnosis Center for Training & Services, Inc, located in Tustin, California. Giselle is certified in the advanced form of hypnosis and hypnotherapy called 5-PATH® and she is a dedicated teacher of the 7thPath Self-Hypnosis® system. I highly recommend her for anyone in the Asia-Pacific Area who would like to receive hypnosis sessions, learn 7thPath Self-Hypnosis® or take a hypnosis and hypnotherapy certification course in Singapore, or in any other country where she offers the course. These other countries could include Peru and Japan, among others. Cal Banyan: First, I want to say thank you for taking the time to do this interview! I am very proud to have been your teacher, contributing to your development and training in hypnosis and hypnotherapy. Please tell us about your background before becoming a hypnotherapist? Giselle Gianella Gabe: Thank you Cal, for this wonderful opportunity and I feel honored to be interviewed by you! It is great to be able to share the knowledge that you have generously given to me. Your generosity as a teacher and a mentor has inspired me. Before I got involved in the world of hypnosis, I had this inner urge to find effective ways to really help my clients and this is what led me to 5PATH® Advanced Hypnosis and 7th Path Self-Hypnosis®. I worked with many clients for several years in the Osawa Clinic in Kobe-Japan, applying Japanese Pelvic Therapy and Chotai Shiatsu. But something was telling me that my clients needed more than just physical help. I felt they needed a different kind of caring, something that will help them with their thoughts and their emotions as well. So when I moved to Singapore in 2002, I began searching on how I can help them in that way. Cal: Why did you decide to learn hypnosis and become a hypnotist and hypnotherapist? Giselle: Actually, what got me realizing that it is all about “mind over matter” are the Gnosis Studies I took in Japan for 4 years. One of the subjects was psychology and a related area, what fascinated me, was how people get ill in their minds first, and then ill in their bodies. In Singapore, I had the opportunity to explore the areas of NLP and in that class I tasted hypnosis and then I wanted to learn as much as I could about hypnosis. Cal: Very interesting, please tell us about your professional training. Giselle: I was trained in 1997 as a practitioner in Pelvic Therapy and Chotai Shiatsu in Japan, which gave me the great opportunity to learn about the body in regards to the physical and energetic levels; I continued my training and became an instructor trained by Pelvic Therapy and Chotai Shiatsu Founder Nakano Funio. 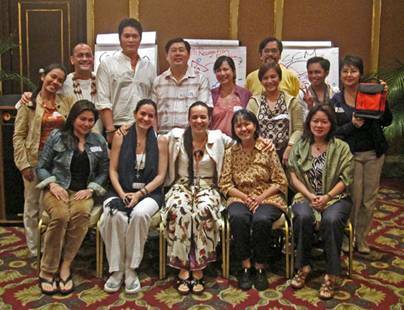 In Singapore,I did the NLP Practitioner and Master Practitioner training, then I started seriously training in Hypnosis. In 2004, the course I took with you Cal, was the most profound hypnosis training I could ever imagine taking. It was your Advanced Hypnosis 5-PATH® and the 7th Path Self Hypnosis® training that blew me away! Right after, I started practicing Advanced Hypnosis 5-PATH® and teaching several 7th Path Self Hypnosis® group classes. My one-on-one sessions and group class sharings deepened my understanding and really inspired me to take a giant step and become an Advanced Hypnosis Instructor and 7thPath Self Hypnosis® Instructor with you Cal, in 2008. As part of my research into the mind-body-spirit connection, I broadened and deepened my learning by becominga Reiki and Sekhem Master. I also have a passion for the Shamanic traditions and been trained with the Inka Wisdom School in Peru. Cal: Your background is very diverse and I’m very glad to hear that you were so taken with my training course. I can see that you really want to help people. Please tell me about your practice. Giselle: I love my practice! It is something that gives me great insights on how to help people and it also gives me ideas for when I conduct group trainings, which is the area I am dedicating more time to. I have trained students in Singapore, Japan, Peru and the Philippines. Cal: Tell me, what is your approach to doing hypnosis and hypnotherapy? Giselle: My approach to doing Hypnosis is simple, first I build rapport and trust with my clients. To me this is the most important thing before doing hypnosis, as I believe hypnosis is a dance, as you say. Then I proceed by using 5-PATH® and teach my clients 7thPath Self-Hypnosis® as well. Cal: Tell us about an interesting case you had recently, if you can. Giselle: One of the most remarkably successful cases that comes to mind was a client I will call “Jenny” (not the real name). Jenny was diagnosed with several auto-immune disease disorders by her doctor. She had a long history of mental, sexual, emotional and physical abuse by both parents. She was under psychiatric care for 14 years trying to solve the issues. She worked with her doctors and psychiatrists along with her parents and basically experienced no improvement during that time. Also during that period, she had four miscarriages. I could go on listing more problems that she had! Through the use of 5-PATH® and 7thPath Self-Hypnosis® she experienced stunning results and is living a much better, happier and fulfilling life, and she reports that her medical conditions have healed. As I worked with her, which was one of my most challenging cases, the best part for me was that I learned a great deal about doing hypnotherapy and a lot about myself as well. Cal: What area do you serve, and what kinds of issues do your clients have? Giselle: Mostly I see clients from Singapore and Malaysia. But I have taught 7thPath Self-Hypnosis® to people from many different countries. I work with a wide variety of issues, and integrate the use of 7thPath Self-Hypnosis® and 5-PATH® with my other skills, and as a result I work with many medical conditions. My clients are usually spiritual people and as a result they enjoy 7thPath Self-Hypnosis® a great deal. Cal: Do you have any specialties or favorite issues you like to work with? Cal: That is interesting. You have a very spiritual practice. Why do you think that your clients select you over other hypnotherapists? Giselle: I feel they choose me because I am passionate and strongly believe in my work and my clients can sense this. Cal, can I share with you things that my clients have told me? They say: “Giselle, you are sincere, I can feel you genuinely care and on top of that you are very knowledgeable” Another client has said “I feel very comfortable with you, as you have shown me that there is hope.” After I worked with clients,they say: “Giselle, you didn’t give up on me and that made feel supported and confident that I will get great results by continuing my sessions with you.” I am humbled when they say things like, “Giselle, you are a gift to this world, thank you for sharing your light…” These are comments that are common among my clients and makes me feel very grateful. Cal: Do you teach any classes? If so,tell me about them. Giselle: Oh Yes! I L-O-V-E teaching the 7thPath Self Hypnosis® System class, as to me, this is one of the tools that is most effective in helping my clients clear erroneous beliefs, thoughts, emotions, cellular memory, anything that does not serve them, or, anything that stops them from living the life they are destined to live, a self-fulfilled, empowered, extraordinarily and youth-filled life. Cal: What would you like everyone to know about hypnosis? Giselle: That Hypnosis is totally AWESOME! It works in areas in which any form of talk therapy cannot reach. It is completely safe, and has helped millions of people around the world. I want everyone to know that hypnosis can be a powerful tool to reach your known or unknown potentials and that hypnosis is a gift that all human beings are meant to experience from professionals that are experienced, passionate, genuine, honest and want the very best for their clients. Cal: I can really feel your passion! What do you see as being the future of hypnosis? Giselle: This is exciting Cal, I see the future of hypnosis as: 1) a topic that is taught in schools, 2) a System that is part of the curriculum of any form of talk therapy, 3) preferred choice by people to help them reach their potentials, goals, financial freedom, optimum health, healthy and meaningful relationships and connection to whatever people conceptualize higher as their higher power/higher love/higher wisdom or divine, to be. In this case, I particularly speak about the 7thPath Self Hypnosis® System. As for the future of 7thPath Self Hypnosis® System, I see it taught in Short Forms in primary schools and in its Full Forms in high schools and communities. May I share about my mother and the 7th Path Self Hypnosis® System? Cal: Giselle I remember you mentioning the amazing transformation of your Mother with the 7th Path Self Hypnosis® System, can you share with us? Giselle: Sure Cal, my Mother is another breath taking case I had; since she is my mom, I have seen her ups and downs, her sufferings, her victories and challenges and one of the things that used to hurt me the most was to see my mom flipping like a yo-yo between being so depressed to being so angry fighting with me and all her children, basically destroying her life and creating big trouble for us, her children. Because I was practicing the 7thPath Self Hypnosis® System and also receiving 5-PATH® sessions to clear myself, I started to behave differently with my mom, I became patient and caring…so one day she said to me smiling ‘Giselle, you have changed…what have you done?’ I explained about 5-PATH® and the 7thPath Self Hypnosis® System, she got very interested and asked me if I could do 5-PATH® for her, I said ‘mom, I would love to, however, we have a protocol and we are advised not to practice on parents or relatives as that may cause inhibition. What I can do for you is I will teach you the 7thPath. Would this work for you? She says ‘whatever you have done has worked on you…so I guess can help me too…’ and so I taught her all the Recognitions in Spanish. Before she learned 7thPath Self-Hypnosis®, my mom had ‘scary voices’ talking in her head. Back then, she needed to take sleeping pills so she could sleep and this made her drowsy and irritable during the day; her head moved by itself as if she has a nervous tick; her blood pressure was very high; she had psycho-somatic asthma; she constantly lost money; my mom used to fight with all her children; she was one of the most negative person there was… and nobody wanted to be around her when she was like that. She was not able to live on her own; she was constantly seeking pity and attention from her children and friends and this made my siblings very angry (I used to get very angry about it too). She began her practice of the 7thPath Self Hypnosis® System, 2 months later, the ‘scary voices’ in her head stopped… she got the insight that the voices were there because she was possessed by “ignorant spirits” that were wondering around the hospital where she was put unconscious with anesthetics so many times in Japan and while she was unconscious, the ignorant spirits attached to her. After another month, her head stopped shaking by itself. She has continued with her daily practice ever since 2004. She is a much more positive and happy person with no more negativity, and no more self-pity. She forgave my dad and now they joke together, talk harmoniously; my mom now is living in the Caribbean-Dominican Republic, living on her own, she is 62 years old and went back to University. She is now into creating jewelry with pearls and crystals and she is a “happy camper” with no more high blood pressure or asthma issues anymore. What I learnt from her is not to push others to change. I used to do this with her and it didn’t work at all. When she saw the change in me, then she felt inspired to do so for herself and she has done it beautifully. As Gandhi said ‘be the change you want to see.’ After seeing the transformation in my mom, I get his message. Cal: Thanks so much for taking the time to do this interview. I’m sure that other hypnosis professionals, and those who are thinking about coming to the profession will be inspired by it. I look forward in working with you to inspire others as we work together to get the word out about the power of hypnosis, hypnotherapy, 5-PATH® Advanced Hypnosis, and 7thPath Self-Hypnosis®. I look forward to seeing you next time I am in Singapore! To you Success and Fulfillment! Dear Giselle, I know it was quite a long time ago now, & I hope you get to see this reply because I wanted to say thank you so much for sharing your story. What an inspiration you are. I think the comments from some of your clients say it all. What a great result for your wonderful Mum, Emi. When those we love see positive changes take place in us, I believe that is the best form of advertising possible. It certainly proved the case for you. Congratulations & Well done. I have just finished watching you in Cal’s Informing Soul DVD and would like to also thank you for allowing us that insight too. Fascinating & inspiring.